Our July CRAFT tour took us to Franny’s Farm in Leicester on the 12th. In just their second year farming, Frances, Jeff and their son Zach Tacy have established diversified small scale livestock on their farm, and presented a great landscape to explore raising sheep, poultry and bees. 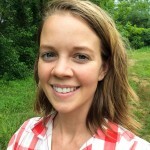 Before we jumped in to the tour, Allison Kiehl, the farmland stewardship and sustainability director at the Southern Appalachian Highlands Conservancy (SAHC), shared with us about their new Incubator Farm in Alexander, NC just 15 minutes from downtown Asheville. The Anderson family donated a 103 acre farm to SAHC in 2013. This year SAHC has opened it up to beginning farmers to help them access land and equipment at reduced rates and provide them with support & training to help build their farm business. They are actively looking for farmers to rent space on the farm – if you’re interested in filling out an application or learning more, click here! The Tacy’s started out sharing their story of how they came to farming and their process of finding land. 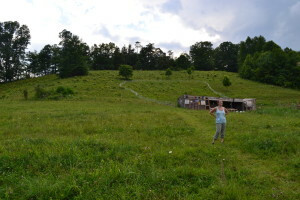 They combed through 90+ different properties around WNC before settling on the 18.5 acres they found in Leicester. Both Jeff and Francis worked corporate jobs before going into farming, and have lots of business experience. They’ve approached their farm in the same way – as a business. 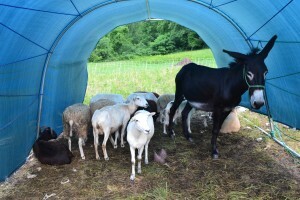 After finding the land they put together a business plan for sheep production to apply for loans and received two loans to buy the property and to start their sheep enterprise from the USDA Beginning Farmer & Rancher Development program. The poultry, bees and small scale veggie production have been an extension of that initial plan. At Franny’s Farm it is paramount for the farm to be sustainable and profitable, and for the Tacy’s diversification is vital to meeting those goals. In addition to raising livestock and annual crops they have plans to build 10 vacation cabins, already host kids groups, two music festivals, and even made their barn raising a big party. Jeff said that, getting people out to the farm is key for their profitability and sustainability. In these first two years they’ve also focused a lot on developing their brand, and starting small as they figure out what works best for them. They haven’t fully reached production scale, Jeff explained. Their focus right now is to develop their breeding so they can eventually sell breeding stock as well. First, we stopped by the bee field where they have four thriving hives. Since they couldn’t grow on the septic field they figured it was the best home for the bees! A few trees provide shade and a wind break at the back of the hives, and leave the hive front open for the comings and goings of the bees. Our group was too large for us to get into the hives, but Frances recommends getting in touch with your local bee association and finding a bee mentor if you are interested in getting started. Then we moseyed over to the chicken yard. Up the hill beyond the chicken house 110 bard Plymouth Rock chickens ranged freely and are rotated to fresh pasture with Premier 1 movable electric fencing. Francis explained that their plan is to set up a strong breeding plan with the Bard Plymouth Rock’s as a dual purpose bird for egg laying and meat production. They’ll be able to incubate eggs and develop their own stock. They are active members of the Sustainable Poultry Network and see the need for reliable high quality heritage birds and are hoping to fill that niche. 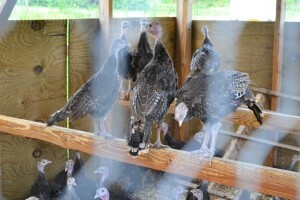 Each year they raise bronze breasted turkeys, also a heritage breed, for the Thanksgiving season. Until they are large enough to fend off hawks they stay in a movable house. Finding non-gmo, organic feed was a challenge for them so they teamed up with other members of Sustainable Poultry Network to coordinate bulk orders of feed from Barrier Farms Mill who will grow, mill, and do custom mixes for them. Our third stop was the sheep herd which are rotated to fresh pasture ever 1.5-2 weeks, again using the Premier 1 fencing. Their donkey does a great job with predator control as well! Currently, they have 18 Katahdin sheep and lamb. Katahdin sheep are a hair breed (i.e. no need to shear) known for their disease and parasite resistance. As with the poultry, Francis explained, they will develop their herd and begin selling them as breeding stock. As Franny’s Farm grows they continue to figure out how many animals their farm can sustain – finding the balance. The capacity they aim for is about 200 chickens, 75 turkeys, and 50 sheep. 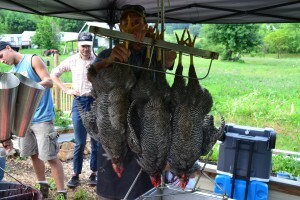 The final stop along our Franny’s farm journey was the chicken processing station. All their poultry is processed on the farm. They had already processed about 2 dozen birds earlier in the day, but saved 10 to give CRAFT members a chance to try their hand. The Tacy’s invested in new processing equipment with hanging cones, a broiler, a de-feathering machine, and stainless steel processing table for eviscerating (removing the organs) to make the process clean and efficient. Jeff and Zach walked us through the process and then gave those that were interested a chance to practice the different steps of the process. We of course would like to thank the Tacy’s for inviting us out, and giving such a great & informative tour. CRAFT is a year-round farmer training collaborative that offers farmers, farm interns, farm employees and aspiring farmers networking and learning opportunities. Membership is rolling, so join anytime! For more information or to join, click here. Or contact Cameron Farlow, Organic Growers School Farmer Programs Assistant at 828.338.9465 or cameron@organicgrowersschool.org.